I enjoy fountain pen ephemera, especially Swan. Judging by the shape of the bottle illustrated this dates back to the 1930s. It’s quite a big jug at 14 cm high. I think this may have been made by Gray’s of Hanley. Among other trademarks, they used an image of a clipper ship, and there’s one on this jug. Me too Deb as you know. I recently bought an empty small Swan Violet Ink bottle, which matches the blue-black one I have. I look o them as old (very old actually) friends. I thought about the jug myself, but I am glad it has gone to a good home. I’ll hang on to it for a while, then probably pass it on. 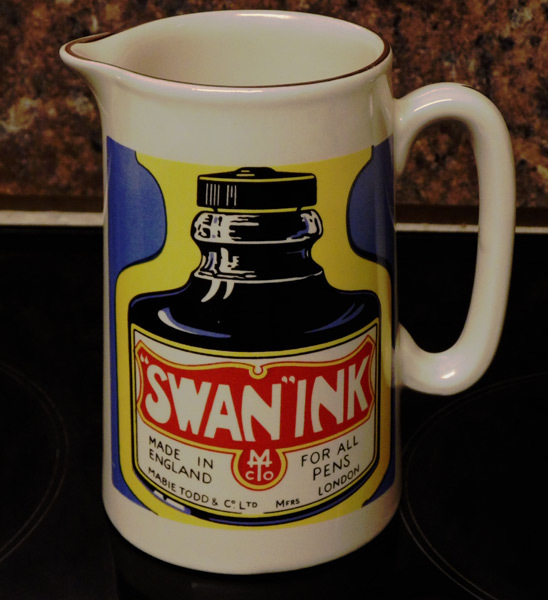 Hmm–Is it for pouring ink or a regular cup for drinking? Sorry not sure as it does remind me of present day advertising mugs. It’s a jug for milk. Advertising ware isn’t exactly a modern phenomenon – it’s been around since the 19th century and maybe longer. A large part of Gray’s output was advertising ware. They bought in white china and painted it to suit the requirements of their clients.